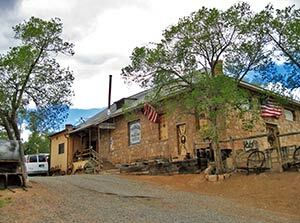 The venerable Toadlena Trading Post, which dates back to 1909, contains a fascinating weaving museum with rotating exhibits. Around here, you will hear people say, "I was raised by rugs." You may furrow your brow while you try to imagine what kind of parent a rug might make, but what they mean is that their mothers earned the income to raise their families by weaving and selling the beautiful Two Grey Hills textiles. "There were 10 of us kids," recalled Toadlena/Two Grey Hills Chapter's grazing official, Derry Lewis. "My dad was much older than my mom. Eventually he became too old to work, and my mom would weave rug after rug, and take them down to the trading post to trade for groceries on credit." Chapter President Stanley Hardy nodded knowingly. "There were eight kids in my family," he said. "My dad died when I was four, so same thing … we relied on the rugs." You hear stories like this all over the Navajo Nation. The neat thing about Toadlena/Two Grey Hills is that it's still going on. Drive a few miles from the chapter house to the venerable, cottonwood-ensconced Toadlena Trading Post and you will see. "We deal with about 150 weavers ranging in age from 7 to their nineties," confirmed clerk Thelma Brown, a weaver herself and daughter of master weaver Violet Brown. "We still extend them credit. Here's our credit book." She produced a thick dog-eared binder, pretty much the same technology the post had in 1909 when Bob and Merritt Smith built it. In fact, if you want to see a trading post that hasn't changed a lot since the turn of the previous century, Toadlena is it. Iron implements hang from the ceiling; the canned goods line shelves behind the counter; an odor of smoke, cured meat and leather hangs in the air like a ghost from the past. It feels like the post has been sitting here exactly like this since the Smiths, but it's a carefully crafted illusion. "Mark (Winter, who reopened the post in 1997) wanted to recreate the original post as much as possible," said Brown. "It was a lot of hard work. By the time he got it, it had been sitting there for 10 years — it was pretty badly vandalized." Name – Toadlena is a crude Anglicization of Tohaali or Tohaalini, "Where the Water Flows Out." The "two grey hills" of its other name are low clay mounds that provided a landmark to a spring and an early Catholic mission. Major clans — Ma'ii Deeshghiizhnii, Táchii'nii, Tsé Nahabilnii, Naakaii Dine'e, Ta'neeszahnii, Hashtl'ishnii. The Tiwa Bear Clan is also here. Upcoming events — Spinning and Carding Day, May 31 at the Toadlena Trading Post, allows inexperienced fiber artists to learn how to process wool and experienced ones a chance to share their talents. "If you want to meet the master weavers, that's the best time," said weaver Thelma Brown, the clerk at the post. The post sells food staples to the locals, but Winter's passion is textiles. He literally wrote the book on them: "The Master Weavers: Celebrating 100 Years of Navajo Textile Artists from the Toadlena/Two Grey Hills Weaving Region" came out in 2011. Brown proudly pointed to her name in the extensive genealogy Winter compiled. Here or the Two Grey Hills Trading Post downvalley is probably still the best place on earth to buy a Two Grey Hills rug, but if you're interested in textiles and don't have the money to purchase one just yet, the Toadlena post also has a fascinating weaving museum where Winter rotates exhibits of his extensive collection. The current exhibit is called "Nakai" and contains breathtaking examples of textiles and intricately fashioned clothing dating back to the Spanish occupation of New Mexico, including some blankets woven for wealthy Mexican families by Navajo slaves. Be sure to ask Brown for a tour; she's a pleasant and very knowledgeable guide. Keep driving north past the Toadlena Trading Post and you'll pass the Tohaali' Community School, one of the oldest schools on the reservation, dating back more than a century. The school has been rebuilt several times, of course, but some of the original buildings are still standing, the steeply sloped roofs and screened-in porches evoking colonial India or Africa. Beyond the school is the Navajo Nation Fish Hatchery, where fish are raised to stock the Nation's lakes and ponds. It was established in 1983. The Navajos were not the first to discover this protected area at the foot of the Chuskas. Toadlena/Two Grey Hills sports a major Chacoan ruin that was partially excavated, and the Anasazi are still a big obstacle to development. "Between the grazing permit holders and the archeological sites, it's really hard to get a homesite here," Lewis said. In more recent history, Toadlena has the dubious distinction of being the place the great chief Narbona was fatally shot in the back by American troops on Aug. 31, 1849 after peace talks went sour. "People think it's on Narbona Pass," said Hardy, "but it wasn't, it was here." Hardy would like to put a monument at the battle site, but that may have to wait for the next chapter president; he's running for Council this year. In 1923,Toadlena was the meeting place of the first Navajo Tribal Council, although it was more or less a puppet of the federal government (one of its first actions was to allow the Indian agent to sign oil and gas leases on behalf of the tribe). Today, not a whole lot has changed in this beautiful and interesting chapter. Most people still raise sheep or cattle, women still weave, and jobs are hard to come by. Few roads are paved, and the rocky roadbeds wreak havoc on people's vehicles. "If you buy a 2014 truck," said Hardy, "it will look 10 years old in two or three months." The chapter is trying hard to advance. On a shelf in Hardy's office are six or seven binders full of ordinances the chapter has passed… but Window Rock hasn't approved, although Toadlena/Two Grey Hills has been a certified chapter for four years. "Everything's ready to go, we're just waiting on them," Hardy said. "It's frustrating." In spite of the conflicts with the Anasazi, the chapter has managed to withdraw 150 acres for chapter buildings and possible commercial development, and it is hoping to see some pavement on one of its main roads in 2016. If it can convince the Navajo Department of Transportation, what it would really like is to partner with Wheatfields Chapter to pave the pass over the Chuskas, which would be the shortest link between Chinle and U.S. 491 and draw more people through the chapter to spend their money. But at the same time, something would be lost if this out-of-the-way nook becomes just another roadside attraction. "We don't do a lot of advertising," said Brown of the trading post. "The tourists who come here, they've heard about it somehow and they don't mind driving miles on a dirt road to get here. I like it because they're people who are really interested in sheep and wool and weaving. "I learn as much from them as they do from me."